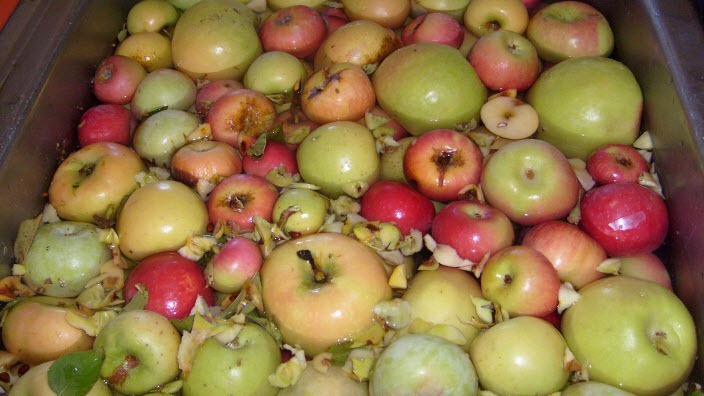 These apples are what are known as “culls.” Which just means that they are either deformed or damaged is some way. They don’t always look so good, but the taste is full and sweet. We got a good mix of green, yellow and red apples which makes for a subtly tasted sauce. Of course they all must be carefully washed and cleaned. So David did the hard work and cut out the bad spots and then cored them. He is my hero!! Once they are clean and cored they get thrown into a big kettle or pressure cooker. I prefer steaming the apples because you can pull the apples out separate from the juice and only use as much juice as you need to get the right texture. I prepare the kettle first with four or five dried cinnamon sticks, several dried cloves and a pinch of salt; then add water and fit the steamer into the pot. All of the juices and spices are caught separately so that you have some control on the taste. Each batch of apples is so different that there really isn’t an exact proportional recipe or a way to give you correct cooking time. Just make sure the apples are soft and not mushy. Once the apples are cooked and slight cooled you start the process of actually making the sauce. This is done by blending them up in the food processor. Using a slotted spoon you take out 4 or 5 big spoonful’s out of the pot and put them into the food processor. Add a little water from the pan and pulse until you like the consistency. Then put the sauce in a big bowl. As you add each small batch of sauce to the bowl stir well. Once you get 95% of the apples ground up and in the bowl taste the sauce and see what you need – more liquid, a touch of honey, more spices? Add as needed and then make a very liquid batch of sauce to add to the bowl. Transfer all the sauce from the bowl into canning jars. 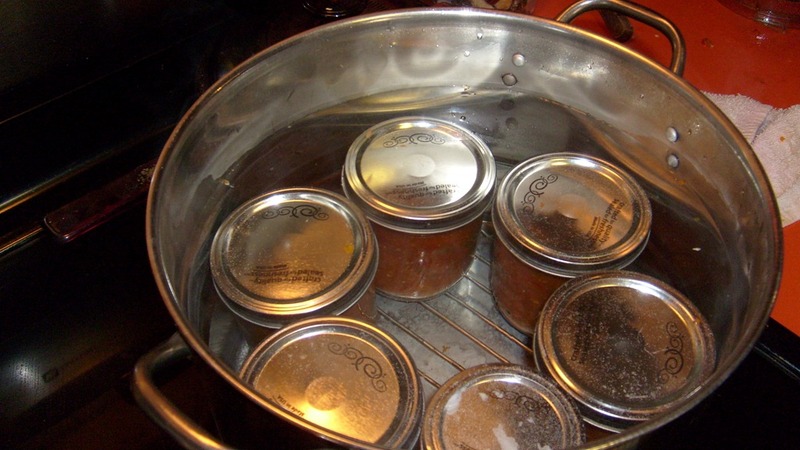 Put the lids on the jars very loosely and then submerge the jars in water. This works exactly like it did for the salsa, so if you need more info refer to that article. Bring the water to a boil. Boil the jars for 20 minutes. Remove from water and let cool. When they are cool tighten the lids and let them sit for 10-12 hours. The apple sauce has amazing flavor and texture and while it is certainly work to can it; we think it is way, way worth it. 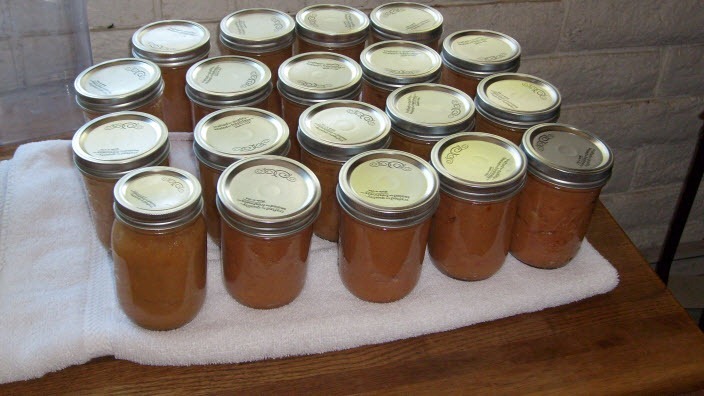 By the end of the weekend we had 40 jars of applesauce and 55 jars of salsa to get us through the winter. Just looking at all those jars makes me happy! This entry was posted in fruit, snacks, vegan, vegetarian, Whole Food Plant-Based recipes and tagged Apple sauce, Canned food, Mason jar, Salsa. Bookmark the permalink.